Viewpoints: Do children need to read more books? 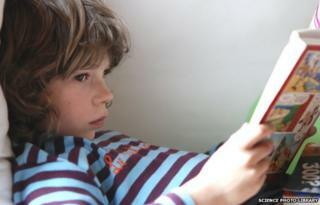 Just over a quarter of 35,000 children from 188 schools told the National Literacy Trust that they read outside school. A similar number said they did not think their parents cared if they read. Do children need to read more books, or can they get the same benefits elsewhere? It is important that children and young people read books, as sustained reading is important. The government should reinstate the free-books-for-children scheme and promote the need for libraries in schools. It is a sad fact that there are more libraries in prisons than there are in schools. Reading for pleasure should be an integral part of the school curriculum from primary school upwards. The phonics reading test at the age of five or six years old is also unhelpful when teachers are trying to develop a love of reading not a dread. These measures would ensure that children and young people enjoy reading and will go a long way to getting rid of the idea that it is either an arduous or unnecessary task. It's been shown time and time again that sharing books, particularly at bed time, has beneficial effects on children. But there are numerous other forms in which reading and writing goes on these days, and I'd be keen to advocate their use as well. It's not just about books; it's about sharing the written form in whatever form it takes. Interactive storybooks on [tablets], for instance, have huge benefits - they could be equally as important as traditional book stories. The most important thing is sharing text with a skilled reader, that's the core. There's often a strain of "golden-age-ism". "When we were young the television was rationed so we enjoyed good books, and why shouldn't children today?" It's quite easy to blame new media for making book reading seem old-fashioned or "uncool". [But] we've got more possibilities now, and the more that we can encourage good quality interactive books in different media, the better. There's more reading and writing going on these days with the advent of things like the internet and mobile technology. Kids are growing up in a much richer literacy world, [but] it's not the world that some of us grew up in. As a child I liked flicking through the pages of a book and looking at the pictures in detail. I use a Kindle now because it's easy and I can download a book from anywhere. I do however miss the fun of picking up a real book. I think we need to be encouraged to read more books because it's important to maintain traditions of language. Using the internet is a way of getting us to read, but the sites are often full of slang and it's very easy to get distracted from a reading task. Children are always going to regard computers as "cooler" than books, but it's very worrying that one in five youngsters now regards being seen with a book as "embarrassing". While children do gain vital literacy skills from reading other material like comics, newspapers, magazines and games, reading a book teaches concentration and builds anticipation and a child's imagination like no other format can. Books need to be back in fashion for schools, and parents must work together to make books trendy again. Whether it's discovering exciting new authors who fire a child's imagination like JK Rowling and the Harry Potter series, which every kid was clamouring to read, or accepting that children prefer to digest their books on an eReader rather than in paperback, books must be back on every family's reading list to give all kids an equal chance in life. I often hear this question from parents: "What should my child read?" Sometimes parents are asking for book recommendations, but many times they are expressing some frustration that their kids just don't enjoy sitting down to read a book. I understand this struggle. I have two very active kids who didn't like to sit still when they were younger. They considered reading to be a full-contact sport on some days. Sometimes kids just aren't in the mood for a book - so what's a parent to do? My answer: Don't focus on books. Instead, focus on reading! Building literacy skills with children happens in many ways. Like most solitary activities, reading might be seen as "uncool" in the playground. Perhaps now books are regarded as a bit old fashioned next to ebooks on mobiles and Kindles, but young people still love reading, and value reading. Technology is often accused of drawing young people away from books and shortening attention spans, but it's not all about social updates and video games. Technology has inspired young people to write blogs, teach themselves to code, to learn together and socialise with people from all over the world. There are a lot of activities competing for the attention of young people, which affects their reading habits, but young people are still passionate about reading. Skye: For me not to be able to read would be like turning the clock back 150 years to a time when women were thought of as servant girls. Not being able to read would mean that young people would not be able to read those fantastic stories that have been written by the great authors. What a waste! Marlies: Reading is even more important today than ever. I am glad that I can read, I think about all the young people around the world who can't, how can their intelligence develop if they have to rely on others for the truth? Reading is about enjoying language, using your imagination to interpret the written word and having the language skills to talk about the story afterwards. Before children can read, they need solid foundations in spoken language and understanding - and we know that one in 10 children will struggle with these skills. Whether children are reading a book, magazine or a Kindle, the fact they are reading and enjoying language is something to be encouraged. We should support children to speak about what they read, in whatever form, to ensure they develop good verbal language, which in turn improves their literacy and numeracy development. Pleasure reading is important for both educational attainment and, arguably, for social mobility. Studies highlight that children who read for pleasure are enhancing and extending their own cognitive development, accounting for factors such as socio-economic background and parental education. All types of reading material are equally valid and important. It is breadth and variety of reading material that is the most significant. It is clear that reading fiction is positively associated with higher reading scores, so it is an important contribution. But it's the young people who read a variety of materials that perform particularly well. A huge part of [encouraging] reading is supporting reading in the home. But another significant element is the focus on reading in the curriculum. My own research has found that whilst primary school teachers do read personally for pleasure, they were insufficiently knowledgeable about children's literature, insofar as being able to recommend books to children. Our teachers don't know enough children's literature. We need teachers who read, and readers who teach. If our focus is the skill to read only, and not the will, we lose the capacity to extend that attainment through focusing on the pleasure.